Pickup at airport via hostel. Cheaper option. Follows parallel to the train for a good portion, but at a faster pace. Several stops along the way + lunch included. Fastest option. Skips out on scenery of Altiplano region. Over the past year, I have amassed a small arsenal of United and Chase points. My point hoarding tendencies finally came to fruition as we set off to plan this trip. 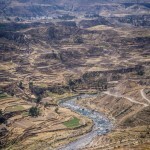 In order to preserve the integrity of the Inca Trail and prevent over-tourism, the Peruvian government limits the total amount of hikers on the Inca Trail to 500 people per day and requires that all hikers travel under the auspices of one of the 150 or so authorized Inca trail tour operators. Of the 500 people allowed on the trail, approximately 250-300 consist of tour guides and porters. 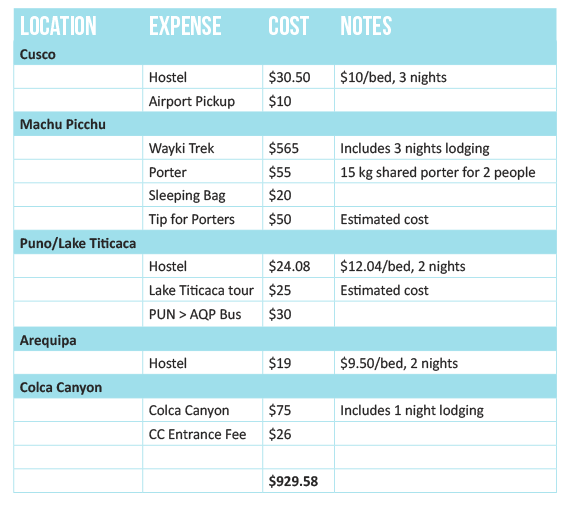 The best (and most expensive) time to hike the Inca Trail is during Peru’s dry season from June- August. 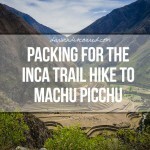 Given the limited hiking spots and high demand for hiking the trail (especially during dry season), the first step in planning your trip to Peru is to book the Inca Trail 4-6 months in advance, and plan airfare and other travel around when your hike takes place. 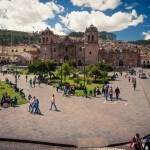 As we began coordinating travel schedules with our friends, it rapidly became apparent that flight costs would add up quickly- tickets to Cusco alone were approximately $800; combined with the other regions we wanted to visit, flights added up to around $1500-$1800! No bueno. Enter points. When I booked our flights in March, a large number of award seats at United’s saver economy/business award level were available. For our specific dates, only saver business seats were available for the IAD >>CUS and CUS>>JUL legs. Saver economy seats were available for the return flights, so we pounced on those. The total cost? 75,000 United points per person. I should note that I spotted plentiful saver economy award seats for all legs of our trip later in August, which would run you 50,000 United points. We’ve got eight flight legs, so I was more than willing to spend an extra 25,000 points for added comfort on 5 of those flights. Had we followed this flight itinerary and paid with cash, the total cost (in all economy) would have run us approximately $1850. Calculate in the value of business class seats, and I think we got a pretty decent bargain. If you are willing to spend extra time and effort to collect points, they can save you a ton of money. I’ve mentioned this before, but if you don’t already, The Points Guy and Frequent Miler are two of my favorite points-gaming blogs and have greatly helped Darren and I on our travel escapades. Other points to note: there are no direct flights to Lima from the DC area, and most international flights to Cusco route through Lima. We’ve got a lovely 5 hour layover in Lima in the wee hours of the morning and will be using Priority Lounge passes to rest and freshen up at the Sumaq lounge before our arrival in Cusco. Thank you again, points. We used Hostelworld.com to book our lodging. The most important factor for us was safety. During our Inca Trail and Colca Canyon hikes, we won’t be able to bring all of our luggage with us and will therefore depend on the hostel that we stay at prior to and after the excursions to store our luggage. It was therefore imperative that we find a place we would feel comfortable leaving our (padlocked) luggage at. Other important factors included hot water (not a given by any means in Peru), proximity to city center, and ensuite bathrooms (sharing is not caring, in this instance). Google ‘hostelworld coupon code’ before booking for a potential discount code. You pay 10% of the cost online and pay the remainder in cash at the hostel. Please note that our budget does not contain flight costs (as we booked using mileage points), food, or any hiking/equipment necessities. That being said, we were pleasantly surprised when everything else added up to under $1,000- it wasn’t our goal, but we certainly did try to keep costs down while planning this trip. We’ll refine our itinerary as we go along our journey but wanted to share the main jist of our travels. 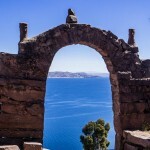 Friends and readers, if you’ve been to Peru- any other suggestions of must see/eat/do places?